When young Canadian wannabe director Jason Eisener entered his DIY Exploitation movie trailer into a South By Southwest competition, the star prize was that Robert Rodriguez and Quentin Tarantino would get to see his work. Never in his wildest dreams did he imagine the trailer would not only introduce Tarantino and Rodriguez’ Grindhouse double Bill Death Proof and Planet Terror, but become a full feature-length film starring his all-time favourite actor Rutger Hauer. Titled 'Hobo With A Shotgun', the movie is arguably more grindhouse than the two established directors’ offerings due to its low budget and DIY ethos. 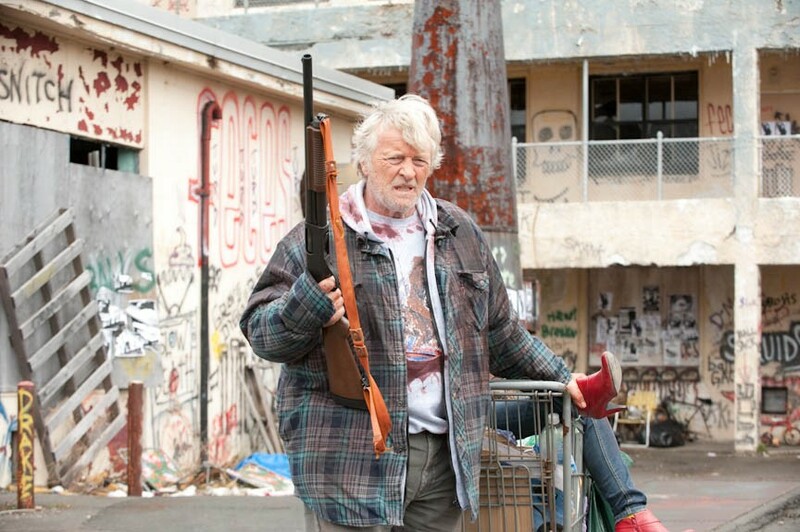 A relentless series of slapstick splatter violence sees the Hobo, Hauer, going vigilante on a vice-ridden town - armed with a shotgun. Dazed Digital: The Exploitation trailer is almost a genre in itself, how did making a feature-length film compare to making the trailer? Jason Eisener: Yeah, what’s fun about making a trailer is you get to do all the best moments from the movie so it was kind of fun making that original trailer thinking of the best moments that could be in the movie. That mindset of doing things that way stuck and we tried to make an entire movie that would be that way where every moment is like the best moment. That’s why the narrative is so crazy. It’s almost for a whole new YouTube audience who process things very quickly – you are constantly being thrown things so quickly. DD: How do you think it compares to Tarantino and Rodriguez’ Grindhouse? Jason Eisener: I don’t know; it’s totally different. Jason Eisener: Yeah, I think so just because of the limitations that we had. We had a significantly lower budget than they had; they had a huge amount of money and a huge cast to make their films. We kind of had the same mentality a lot of exploitation filmmakers had back in the 70s and 80s where they were making films that compete with the studio films that had huge budgets and big stars in their movies and so these exploitation filmmakers would come up with crazy ideas for their films to get people in the cinema. That was our mentality-making Hobo - We didn’t have the budget, we can afford maybe one star, and we started thinking about all these crazy ideas about how we can get people talking and get people into the seats. DD: How did you get Rutger Hauer? Jason Eisener: When he got the script he requested to talk to me on Skype. I’d never used Skype before and I was so nervous going into the conversation because he was my childhood idol. The distributor asked me to write a list of my top five favourite actors and I put Rutger Hauer at the top of the list thinking there’s no way this is going to happen but at least it will give people the idea of the kind of performance I want from an actor but sure enough they put it to him and next thing I knew I was on Skype with him. We just hit it off – we talked about the movie for about ten minutes and then we just talked about our lives. He’s also an ocean conservationist and before I wanted to be a director I wanted to be an ocean biologist so we had a lot in common and talked for like an hour. It was such a great conversation that I left the call thinking I didn’t even ask him if he was down to do the movie. DD: I read he put some input into the script, what was it? Jason Eisener: It was a lot of stuff with the character, the hobo. The guy who played the original hobo in the original trailer was not an actor; the anger you see on the screen is real. DD: Is he a real hobo? Jason Eisener: Borderline, yeah. He is an angry guy and I would just bring that out of him and that is for real. When we shot the feature he was sat right beside me at the monitor – he’s a great friend of mine – and Rutger worked with him a lot and they would work on scenes and talk and have coffee and Rutger would come back with all these inspirations that he’s got from Dave and bring those into the script .We were not glued to the script, we were open to all our actors to pitch lines. It was great working with Rutger in that way because he’s a great writer too and he comes out with some pretty awesome ideas. For instance, in the movie there is a scene where he is talking to a bunch of newborn babies at a hospital and he’s telling them that if they grow up in this town that they could become drug dealers or prostitutes and Rutger wanted to add, “…or maybe you could end up like me – a hobo with a shotgun”.